Once Upon a Time in the Vest: V8 N. 44 Dave Milliman R.I.P. Yesterday, Bruce Kritzler sent me a note mentioning the passing of Dave Milliman. bigger than life as we sometimes say about an influential person. He was an instrumental cog in the 1970s and 80s running boom in the Southeast US and eventually in other parts of the country. It is more than meaningful when friends send unsolliceted notes and memories of a person when they die. Dave had lots of those kinds of people in his life who remembered him and were willing to speak up. There will be a memorial Saturday @ 5, including a run, in Travelers Rest SC @ Pace Magazine and Running Shop. Dave Milliman passed away early this week, after his second bout with prostate cancer. Dave was the first person I met from the Florida Track Club, while still living in Ohio. Seemed like we were around the same speed racing at AAU Cross Country Championshipz and Charleston 15 miler. So ended up running together/against each other and talking after races. He encouraged me to move down to Gainesville, and I finally did Dec. 1976. Stayed with Bob Hans, originally from Cincinnati and Defiance College. Got a job at Athletic Attic, and after about a year I was able to hire Dave Milliman. He knew more about running shoes than anybody, and had experienced every running injury, so could empathize with customers. Jimmy Carnes saw Dave's potential and started having him train new franchise owners. He helped open stores in Galveston, Columbus, and Pittsburgh. He continued to work for Carnes after Athletic Attic went out of business, helping start the US Track & Cross Country Coaches Assn. and was publisher of their quarterly technique magazine. After Carnes passed Dave moved to Greenville, SC and worked at his bother Jeff's store, Greenville Running Company, and published the GTC magazine PACE. Dave was about 6-2, 170, and Frank Shorter called him the best "big" runner he knew. Think Dave's pr's were around 14:37, 30:37, and 2:27. He started "Team in Training" groups in Gainesville, and coached hundreds of people. Was always ready to offer advice and encouragement, to beginners and elite. I’m sorry to hear this news. The implication was I was running that pace just to annoy him. I am truly sorry that he's gone. 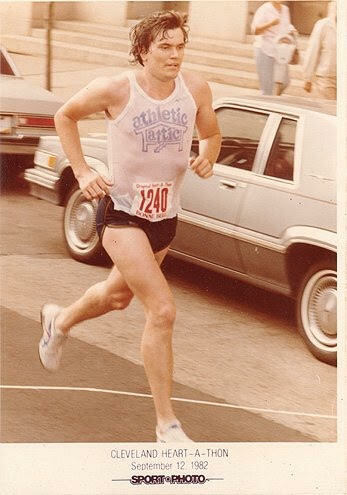 I didn't know Dave in his prime running days (nor in mine), but it was through running that we connected. I don't recall where and how we met, but I recall seeing him in San Falasco where he'd train people to run their first marathons. He would regal me with stories of the old days, how one day as a lark he and others put on spikes and blew through the SF 6-mile loop in times I could never approach even on a track. The times were so fast that they realized that it was a bit less than 6, but who was going to tell? Even though he had been a great runner, he wasn't a bit arrogant with we lesser folks. He always had time to chat, and I always looked forward to seeing him. Due to injuries, I stopped running nearly a decade ago and lost touch with Dave. Our very casual relationship didn't prompt me to look him up after hanging up my running flats. Undoubtedly it was my loss. I wish his family all the best and to take heart in the fact that Dave is well remembered. The echoes fade from the locker room walls as the last victory dims into memory. Long since the hot showers and white towels have been tossed away, you turn the key and ease into the snow covered highway, leaving the locker room for the last time. For most now, the years have given out to quiet memory, like trophies hanging in a darkened case. They are opened only to show at cocktail parties and class reunions. But once a month, or so it seems, you wake again from that dream you have had since the championships when you won the long jump and broke the tape to celebrate victory with your 4 x 1 teammates. Etched in memory so fine you awake to taste the victory again and again. You never speak of this, never mention it at cocktail parties or the reunions. But in your deepest thoughts you feel blessed and filled with a satisfaction you never have to express. Your team won the title and for the rest of your life, you remain a champion. If you were lucky, you were blessed to have a mentor, someone who coached you, showed you the way. In track & field, this someone more than likely enriched your career and as well as your personal life. The coach, your mentor. Mentors carve our lives with impressions undimmed and undiminished by the passing of years. Some mentors have been Olympic coaches, some not so accomplished, but each has often served as both father as well as coach. Each mentor/coach loved his sport and his predilection. This love was passed on to us. We often honor a coach by the listing of names. The names of his athletes, of those who won championship, those who went on to Olympic glory, those who stepped up to fame and fortune. When we think of a Hall of Fame coach, we may also think of a solitary man, standing in twilights’ shadow, holding a watch at track side - timing the last interval of the day. And yet, that man, the solitary figure to whom we give honor at track meets and reunions may not have coached any list of champions. He may not have sent young men and women on to Olympic glory. He may have worked hard, trained many fine individuals, shown hundreds of young men and women the way through the wilderness. And yet, the accolades he has received do not compare to those whose fate lead down an Olympic road. …the solitary figure to whom we give honor at track meets and reunions may not have coached any list of champions. As the echoes fade from the championship moment, when all the towels have been put away, many an athlete may close the locker room door for the last time but keep the memories of a mentor as well as a performance. Many of these athletes have memories of a modest performance by any other measure, but yet, a personal milestone, an achievement not diminished by a stopwatch or a place in a national championship. The man they remember, their coach, is just as deserving to be honored and remembered. No matter how measured, no matter how small against a list of giants, athletic achievement and personal satisfaction will always haunt the playing fields of memory. Both in the memories of those returning for a college reunion and for that solitary coach, spending another day in the classroom of life - teaching the fundamentals of individual perfection. There is more to this pursuit than the chasing of school records, of running, jumping, and throwing. But for this, if for nothing more, our coaches will always be our heroes. This piece written by Dave Milliman has appeared in a number of journals and websites over the years. Ed. So articulate! On my run today, I felt like he was there. 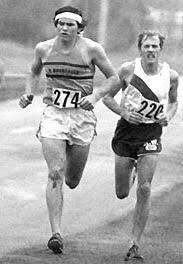 He epitomized the comraderie of running.